I try to check Amazon’s “Gold Box” deal of the day as often as possible, which usually amounts to the one day per week when I actually remember to do so. I luckily happened upon a particularly attractive deal recently. 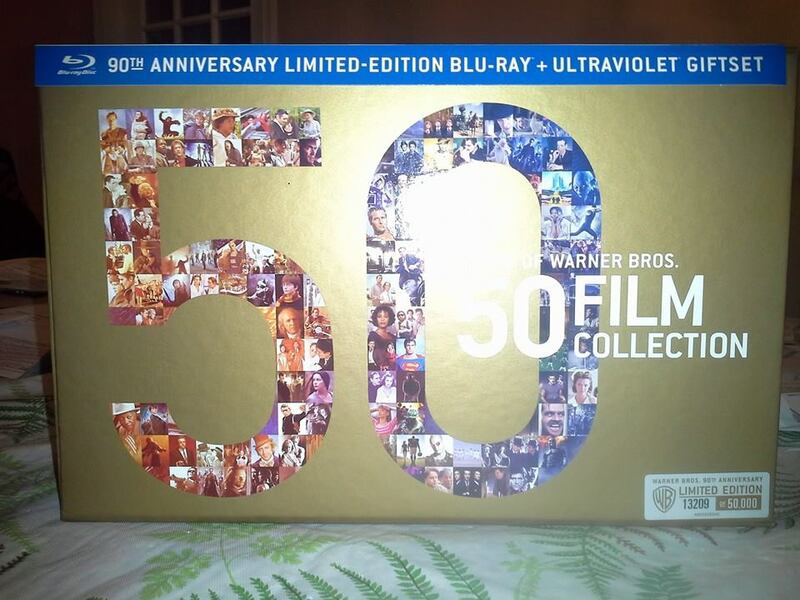 The phenomenal Warner Brothers 90th Anniversary blu-ray Collection was on sale for a whopping 70% off. 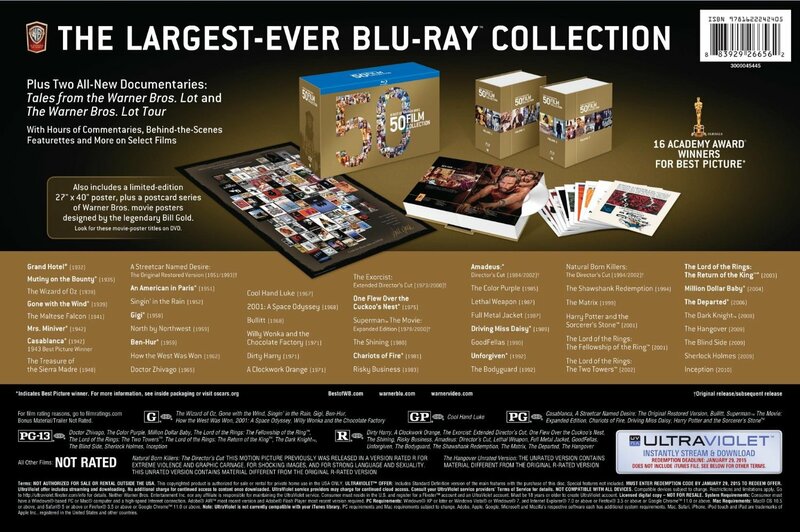 This set includes 50 movies plus a DVD documentary about the history of the studio. That this is only #13,209 in the limited-edition run of 50,000 suggests the price will continue to drop. Streaming media options and other market factors have driven down the price of blu-ray and DVD fairly dramatically over the past three years or so. This set is no exception. Originally retailing for $600.00, you can pick one up for about $250.00–$270.00 at this point. The Gold Box Deal in question had it going for about $100 below that. Even though that was still a luxury, I was too excited by the title list not to pull the trigger. While any list or collection such as this one isn’t going to please everyone (Why all three LOTR films, while other series only get one entry? ), and there are a couple of duds in the mix (The Bodyguard?!? ), even the most jaded movie fan will have to admit there’s a treasure trove of classic and/or influential films in the set. There are sixteen Best Picture winners alone, plus another few films that easily could have won that top honor. The set itself is an A-plus overall, especially if you’re buying it at something like $3.00 per film. Most of the movies included are also the “extended” or “director’s cut” versions of the films in question, where applicable. In other words, you’re getting deluxe editions of every movie that has such a version. I should note, however, that these blu-ray discs are sometimes just the first disc of a two-disc set, where the second disc included a lot of additional features. Personally, I don’t care much about that. But people should know they’re sometimes getting one disc of was was once a multi-disc set for a given film. Most of the movies, though, are complete, one-disc editions. The movies come in two book-like “volumes” filled with great still photos and a timeline of movie history. There are also a bunch of extras included, such as a set of postcards as well as a poster. What’s the point of all this, other than self-congratulation over the purchase of a pricey blu-ray collection? I intend to review all of these movies as I work my way through the set. These reviews may be straightforward, they may just talk about one aspect of a given film, or they might be satirical. Who knows? I’m not going to be married to a consistent but ultimately confining format. But, even though it may take me a year, I’m going to work my way through all of these, roughly in chronological order. I’ll even re-watch movies I’ve seen before, and write about each one individually. Except maybe Lord of the Rings. With that in mind, be on the lookout in the near future for the first in a lengthy series of untimely movie reviews. This entry was posted in Commentary, Movies, Reviews, Site Stuff and tagged Blu-Ray, Commentary, Movies, Reviews, Site Stuff, Warner Bros., Warner Brothers. Bookmark the permalink.